Star Fruit or Carambola. © 2006 Peggy Trowbridge Filippone, licensed to About.com, Inc.
Star fruit isn't a staple fruit in the United States, however, restaurants do use them as garnish. The star-shaped fruit can be found in abundance where they are heavily cultivated in parts of Southeast Asia, China, and the Pacific Islands. The carambola, botanically known as Averrhoa carambola L., is native to the Orient despite the Spanish sound of its name. It is often called a star fruit because of the shape of the slices when cut horizontally. Carambolas are now a fledgling commercial crop with most being grown in Florida. Prime harvesting season is from late summer to early winter, although some will bear fruit year-round in tropical moderate locations. Those with tinges of green on the lobes may be further ripened at room temperature. Due to their popularity as a garnish, star fruit is now being sold in many specialty produce markets as well as larger chain grocery stores. Fresh carambolas are often eaten out of hand like most fruits, as well as in salads, although the most popular use by far in the U.S. is for garnishing. Try substituting star fruit for citrus in both savory and sweet recipes. To cut a star fruit chop off the top and bottom of the fruit. Then, cut the green edges along each "point" of the sides of the star fruit. Then, cut the star fruit horizontally to create the signature stars. Remove the seeds(or not) and eat away. The taste has been described as both sweet and slightly sour. A note on how to eat star fruit properly: if you have no kidney problems, you can eat all the star fruit you want. However, if you have issues with kidney function or your kidneys are otherwise impaired, eating star fruit may be dangerous. Called “star fruit intoxication,” symptoms include persistent hiccups, nausea, vomiting, agitation, insomnia, mental confusion and convulsions that occur within one to five hours of eating the fruit. If you experience these symptoms, get medical help. 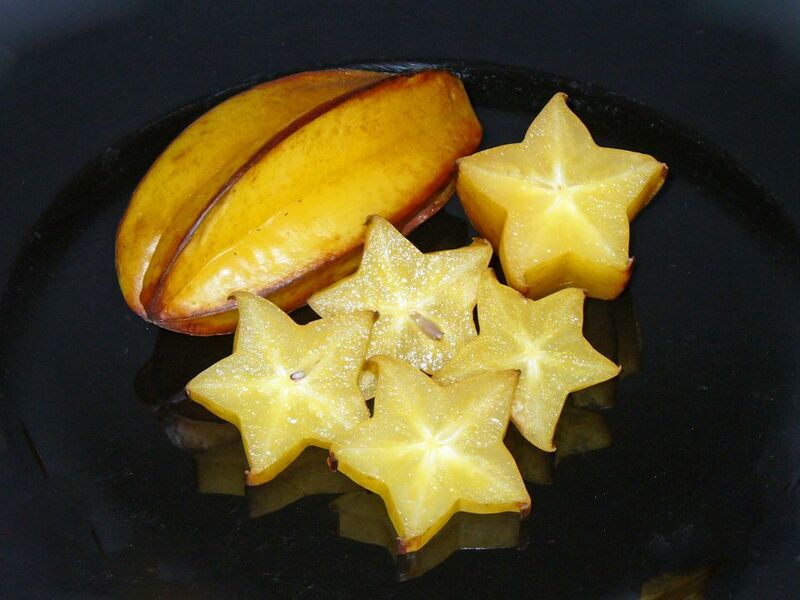 Star fruit at its best is sweetest in its bright yellow color. You may also see it green, which tastes slightly more acidic. People have different preferences, so pick both and find out which you prefer. The larger the star fruit the sweeter it will be. You'll also want to pick star fruit that is free of blemishes and firm to the touch. So you know, star fruit should be kept in the refrigerator and will keep up to two weeks.